Down The Hill is a fast-paced arcade game that will entertain you for hours and hours. You move down and infinite mountain. You just tap left or right to begin your descent. But you have to be aware of all the dangers in your way. Trees might lock you your progress, TNT will blow your character up and the lava fields... well they are made of lava. 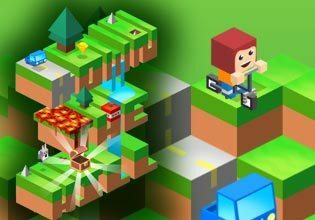 Amazing graphics, simple yet challenging gameplay and randomly created levels are an addictive mixture that will get you hooked to the screen for a long time. Play Down The Hill now for free and see if you can beat the highscore!